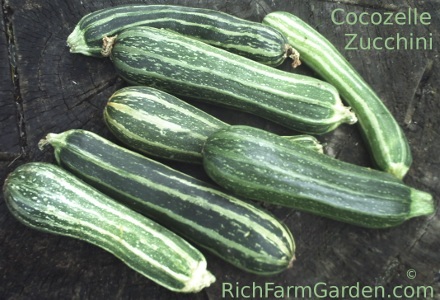 Cocozelle Zucchini (45 days) Heirloom variety known in the late 1800s as Italian Vegetable Marrow or Cocozelle di Napoli. Dark green with lighter stripes and pale green flesh. #P-601A One Plant in 2-1/2inch pot; $4.50 . #P6-601 Six Plants- moist root shipping pack; $11.50 . 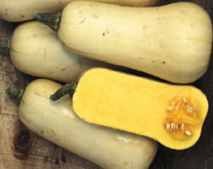 Yellow Crookneck (42-60 days) Early yellow squash with smooth skinned fruits with white flesh. Acorn, Table Queen (45-55 days) This heirloom variety bears dark green acorn shaped fruit on vigorous vines. Stores well. Buttercup (95-105 days) Productive vines bear 4-6in. dark green fruits with sweet creamy orange flesh. Butternut (100 days) This old favorite has 3-5 pound bell-shaped fruits with tan skin and orange flesh. Keeps well. Carnival (85 days) F1 Hybrid. Colorful acorn type squash with skin colored in varying patterns of green, yellow, orange and tan. Excellent keeper. Chicago Warted Hubbard (115 days) Oval 12-14 pound fruits have dark green warted skins with deep orange flesh that is sweet and delicious. Excellent keeper. Choctaw Sweet Potato (100-120 days) Rare heirloom of the Creek and Choctaw nations. 5-15 pound oval shaped fruit borne on 20ft. vines. Fruit is a deep orange and has a taste reminiscent of sweet potatoes. Great for pies. Good keeper. Cochiti Pueblo (110-140 days) Shapes vary (squat, oblong), but most weigh between 1-1/2 to 2-1/2 pounds and have light orange flesh. Good baking squash that keeps well. Cushaw, Green Striped (115 days)10-20 pound crookneck fruits have creamy skins striped with green. Flesh is light orange in color ; taste resembles a pumpkin. Makes wonderful pies. Cushaw, Yellow Striped (115 days) Pretty orange and white version of the classic cushaw. Fruits weigh in at 10-20 lbs. and keep very well. 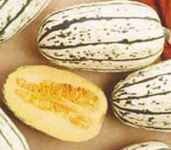 Delicata (100 days) Heirloom variety with pale orange flesh marked with dark green stripes. Oblong fruits have sweet cream colored flesh. Hearts of Gold (90 days) F1 Hybrid. Pretty dumpling squash with a green and white striped skin and sweet golden yellow flesh. Hokkaido (100 days) This rare variety has sweet stringless flesh covered with grey-green skin. Fruit is round & slightly flattened. Hopi Taos (110-120 days) Rare. Pear shaped 20-30 pound fruits with green & white stripes. Jarrahdale (100 days) Pretty 8-12lb. slate grey fruits are deeply ribbed and have a thick orange flesh that remains sweet and keeps well. Lacota (100 days) This rare heirloom variety was a favorite of the Lacota Sioux. Red-orange skin and flesh has a rich, nutty flavor. Wonderful for baking and for pies. Long Island Cheese (108 days) Heirloom from Long Island. 6-12lb flattened tan-skinned fruits resemble a wheel of cheese. Flesh is moderately sweet and keeps very well. Nanticoke Indian (110 days) Heirloom of the Nanticoke nation. Colors of 3-6 pound turban-shaped fruits range from blue-grey, green, buff & pink. Nutty flavor. Padana (105 Days) This pretty import from northwestern Italy is shaped like a pumpkin with alternating grey/green and orange striped ribs. Dry sweet flesh can be used for soups, gnocchi, and roasting. Good keeper. Pink Banana Squash (110 days) Deep pink skin and stringless yellow-orange sweet flesh great for pies. 10-20lbs. Red Warty Thing (100 days) A weird squash looking rather like a cross between a pumpkin and a hubbard squash. Skin is deep orange in color and covered with warts. Great novelty as well as possessing a sweet stringless flesh. Spaghetti (100 days) When baked or boiled whole, these buff-colored fruits have a flesh that separates into strands like spaghetti and can be eaten the same way. Texas Indian Moschata (100 days) Rare heirloom. Slightly flattened 10-15 pound orange fruits resemble a pumpkin.